apid, uniform germination and emergence of corn help set the stage for maximum grain yield at the end of the season. Without a successful start to the season, the crop is behind the proverbial "eight-ball" right from the beginning. The good news is that there are only four simple requirements for uniform germination and emergence of corn. The bad news is that one or more of the requirements are sometimes absent in one field or another. Adequate and uniform soil moisture at the seed zone. Adequate soil moisture is most simply defined as not too dry and not too wet. Most growers know what "adequate" looks and feels like. In reality, "adequate" soil moisture is probably close to field capacity. Uneven soil moisture throughout the seed zone is the primary cause of uneven emergence, the results of which can easily be yield losses of 8 to 10 percent (Carter et al.). Uneven soil moisture in the seed zone can be caused by variable soil characteristics, tillage patterns, unusual weather conditions and uneven seeding depth. Remember that uneven seedbed soil moisture can be defined as �adequate� versus �too wet� as well as �adequate� versus �too dry�. Useful Tip: When seedbed conditions are dry, make sure that your choice of seeding depth ensures uniformly adequate soil moisture for the germination of the seed. Even though a 1.5 to 2 inch seeding depth is a good choice for many conditions, do not hesitate to increase seeding depth to 2.5 or 3 inches if that is the depth where uniform soil moisture is located. Planting shallower than 1.5 inches increases the risk of poor or uneven germination during subsequent drying of surface soils. Fig. 1. 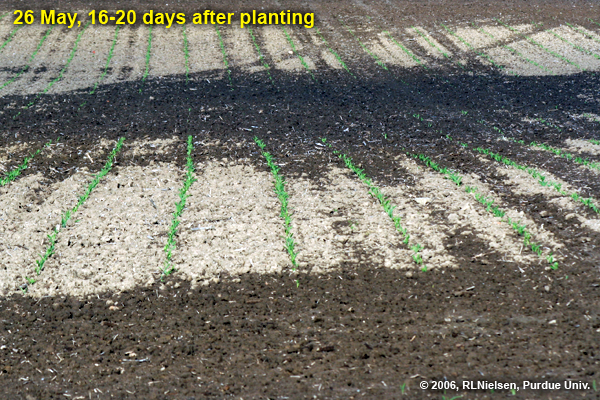 Uneven corn emergence in 2006 due to uneven (too wet vs. "just right") seedbed soil moisture. Adequate and uniform soil temperature at the seed zone. Corn will germinate and emerge slowly and/or unevenly when soil temperatures are less than 50F. When soils warm to the mid-50's or warmer, emergence will occur in seven days or less if soil moisture is adequate. Thermal time from planting to emergence is approximately 115 growing degree days (GDDs) using the modified growing degree formula (Nielsen, 2012) with air temperatures or about 119 GDDs based on soil temperatures. Uneven soil temperature in the seed zone can be caused by variable soil texture, soil color, soil drainage, surface residue cover in reduced tillage systems and seeding depth control. Temperature variability during germination and emergence is most critical when average soil temperatures are hovering about the critical 50F minimum threshold value. Useful Tips: Dark-colored soils will typically warm more quickly than light-colored soils. If soils dry differently across the field, the drier areas will typically warm faster than the wet areas. Uneven residue cover (surface trash) in reduced tillage systems causes significantly lower soil temperatures under the heavier cover than under barer spots in the field. Uneven seeding depth exposes deeper planted seeds to slightly cooler seed zones than seeds placed shallower. Consider row-cleaning attachments for the planter to move aside the surface trash during planting and expose the seedbed to sunlight and its warming effects. Consider strip tillage practices in the future to better manage surface trash in a reduced tillage system. Fig. 2. 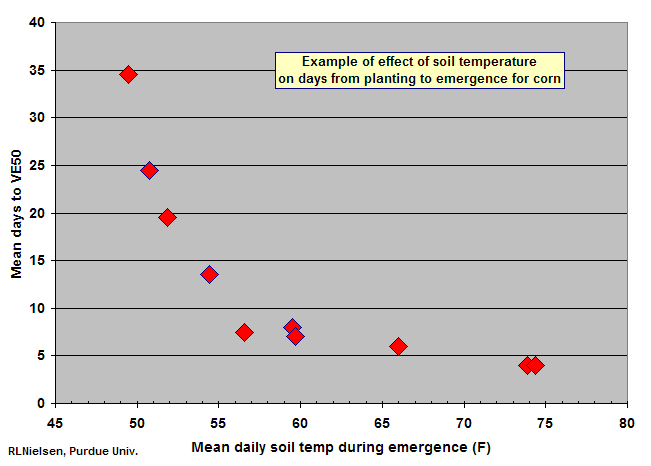 Example of the effect of soil temperature on the timing of corn emergence. Useful Tips: Whippers, wipers, movers, fingers, and other similar trash management gadgets for the planter are most beneficial when you are challenged with rocky, cloddy, or trashy surface soil conditions. They help clear the way (literally) for the planter's double-disc openers to more easily do their job of creating an optimum seed furrow. Other planter attachments that help press the kernels into the seed furrow can improve seed-to-soil contact and seeding depth uniformity when seedbed conditions are otherwise challenging. Surface Soil Free From Crust. Severe surface crusting or compaction will restrict emergence of the coleoptile and cause underground leafing or plant death. Severe sidewall compaction can also limit elongation of the mesocotyl and emergence of the coleoptile. Useful Tip: Avoid excessive tillage prior to planting the crop, especially if significant rainfall is forecast prior to emergence of the crop. This will help avoid the development of dense surface soil crust. Avoid excessive downpressure on the closing wheels of the planter in order to avoid compacting the surface soil on top of the seed furow. Avoid planting "on the wet side" in order to avoid smearing the furrow sidewalls with the double-disc openers. Carter, Paul, Emerson Nafziger, and Joe Lauer. Uneven Emergence in Corn. North Central Regional Extension Pub. No. 344. http://corn.agronomy.wisc.edu/Pubs/UWEX/NCR344.pdf. [URL accessed May 2015]. Jasa, Paul. 2010. Avoid Sidewall Compaction at Planting with Planter and Planting Adjustments. CropWatch Newsletter, Univ. of Nebraska. http://cropwatch.unl.edu/archive/-/asset_publisher/VHeSpfv0Agju/content/4085998. [URL accessed May 2015]. Jasa, Paul. 2010. Tips to Reduce Sidewall Compaction. CropWatch Newsletter, Univ of Nebraska Extension. http://cropwatch.unl.edu/archive/-/asset_publisher/VHeSpfv0Agju/content/4086006. [URL accessed May 2015]. Lee, Chad and Carrie Knott. 2015. Looking Ahead: Expect to See Sidewall Compaction. Grain Crops Update, Univ Kentucky Extension. http://graincrops.blogspot.com/2015/04/looking-ahead-expect-to-see-sidewall.html. [URL accessed May 2015]. Nielsen, RL (Bob). 2010. Visual Indicators of Germination in Corn. Corny News Network, Purdue Univ. http://www.kingcorn.org/news/timeless/GerminationEvents.html. [URL accessed May 2015]. Nielsen, RL (Bob). 2012. Heat Unit Concepts Related to Corn Development. Corny News Network, Purdue Univ. http://www.kingcorn.org/news/timeless/HeatUnits.html. [URL accessed May 2015]. Nielsen, RL (Bob). 2014. The Emergence Process in Corn. Corny News Network, Purdue Univ. http://www.kingcorn.org/news/timeless/Emergence.html. [URL accessed May 2015]. © 2015 , Purdue University, an equal access, equal opportunity university. This material may be available in alternative formats. If you have trouble accessing this page because of a disability, please contact RLNielsen at rnielsen@purdue.edu.